• Bring oxygen into the body and expel carbon dioxide - oxygen travels through the wind pipe (trachea), bronchi and bronchioles to the alveoli (air sacs), where it diffuses through the thin alveoli walls and adjacent pulmonary capillaries (mini blood vessels) into the bloodstream; carbon dioxide travels the reverse pathway, diffusing from the bloodstream into the alveoli and out of the body via exhalation. 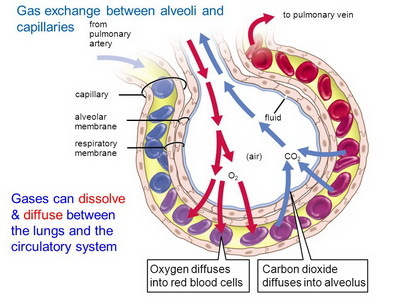 This process requires the lung airways to expand and relax thousands of times a day.pathway, diffusing from the bloodstream into the alveoli and out of the body via exhalation. This process requires the lung airways to expand and relax thousands of times a day. FIndings of Sadis Matalon and colleagues, Univ. of Alabama's Dept of Anesthesiology Pulmonary Injury and Repair Center. 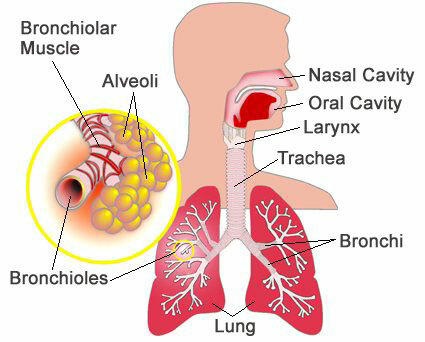 Mucus membranes line the inside of your respiratory tract i.e nose, mouth, windpipe, bronchi, bronchioles - their purpose is to produce mucus (containing mucin) to lubricate the airways and to entrap any breathed in dust, particulates (e.g. carbon from smoking or long-term inhalation of city air), or disease-causing organisms (transporting them back to the pharynx for swallowing), and thus prevent them from accessing the lungs. If the membranes become inflamed they overproduce mucus, which may run down the nose or the back of the throat. Mucus is produced by submucosal/bronchial glands and goblet cells located between the epithelial lining cells. Mucus-producing glands undergoing prolonged exposure to irritants leads to their enlargement due to cellular replication. The SMALLER bronchioles do not have cilia or mucus-producing cells, but they do have another type of secretory cell (called clara cells). Clean-up Crew - "Dust Cells"
As many as 100 million macrophages each day carry their conquests out of the airways to be swallowed and digested. 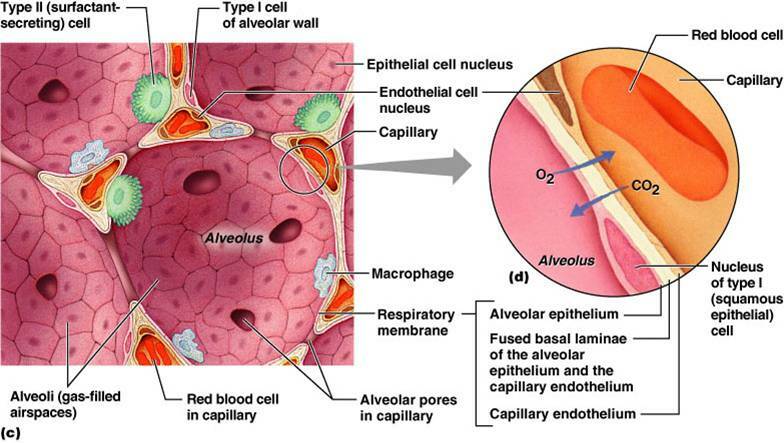 (2) Secrete "non-stick" surfactant to coat inside wall of alveoli and smallest bronchioles - prevents aveolus walls clinging together as alveolus deflates on exhalation, which would otherwise make it difficult for re-inflation on the next inhaled breath.